Peyton Manning falls just short as Cam Newton leads the Panthers to victory, according to EA. Sorry, Peyton. 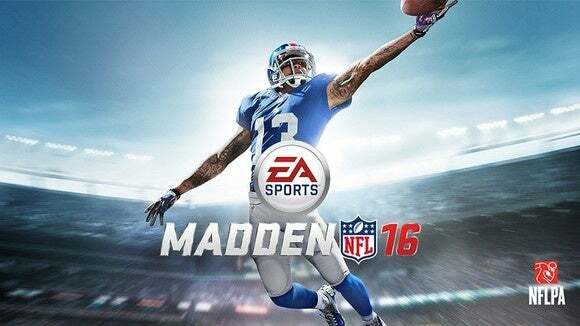 Both Electronic Arts’ Madden simulation as well as Microsoft’s Bing have picked the Carolina Panthers to top the Denver Broncos this Sunday in the Super Bowl. During the past 12 Super Bowls, Madden has picked the correct winner 9 times. This year, Madden NFL 16 says that the Panthers will top the Broncos, 24-20. Bing has also predicted that the Panthers will win, but didn’t forecast a final score. While Microsoft uses a variety of data to arrive at its final predictions, including betting lines, historical matchups. and social signals, EA attempts to simulate the game with actual players. That means that EA supplied a wealth of detail about the “game,” such as predicting that Panthers quarterback Cam Newton would end up as the game’s MVP, after a goal line scramble ended with him scoring the game-winning touchdown. EA noted that in last year’s Super Bowl 49, the Madden simulation correctly predicted the final score, but also that New England Patriots quarterback Tom Brady would win the Most Valuable Player award and that Julian Edelman would score the deciding touchdown. Bing, for its part, has had a decidedly mixed record covering football, but Microsoft claimed that the company correctly called 63 percent of this season’s games, finishing the season with a 161-95 record—a few games ahead of Vegas odds, it said. This season, Bing also began making fantasy-football picks for some of the skill positions—quarterback, tight end, wide receivers, and the like—and finished on par with major sports sites, Microsoft said. Microsoft has also tried to pick the winners in the 2016 election primaries. For Iowa, Microsoft is 0 for 1: it picked Donald Trump and Hillary Clinton to take the state. Instead, Ted Cruz won the Republican caucus, and Clinton and Bernie Sanders finished in a race that, at press time, remained a virtual dead heat. Why this matters: The real question here is whether, over time, both simulations will improve to the point where they report results that are significantly better than Las Vegas’s own human bookies. If that becomes the case, then Bing, Madden, and other noteworthy simulations will become a mutual fund of sorts for sports betting: you may not win every individual game, but over time you’ll come out on top. As for the Super Bowl, who knows what will happen? And that’s why the world watches.